Was very fortunate to receive the Tester package from MVP Disc Sports containing the latest discs set for release on May 22nd, Plasma AMP,Axiom Discs Neutron FIREBALL and the Fission PHOTON. 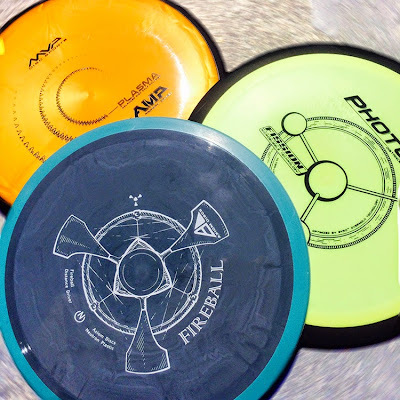 FIREBALL: The one MVP sent is so darn swirly I almost didn't want to throw it, but was curious about it and let it fly. Overstable is a fitting description for my arm strength. This will be in the bag for those shots that require a heavy fade at the end of flight. PHOTON: The Distance Driver wide rim really feels nice with my grip. Need more backhand throws to fine tune it's potential, but it felt good and flew well. The biggest surprise however was with my forehand drives. I got stable throws and more effortless distance than with any of my other forehand discs. Keeper for sure. Excited about getting in more work with this one. AMP: I must state this- I LOVE PLASMA PLASTIC! It made me fall in love with the VOLT all over again and now it will put an AMP in my bag where there never was one before. The grip and flexiblity of Plasma is perfection and the stable to slightly understable flight of the AMP will be a fitting compliment to the VOLT. Looks like the beloved newcomer, WRATH, will have some competition.